Prac-Tic Spot-On for Very Small Dogs 3 Pack is for the treatment and prevention of flea infestations in dogs weighing 2 - 4.5kg. Prac-Tic has been specially formulated to provide protection for a full month and will remain effective after wet activities such as walks in the rain, swimming and even after shampooing. 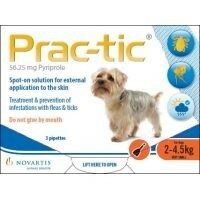 Prac-Tic kills 99% of fleas in 12 hours and 100% of fleas in 24 hours. 99% of ticks are killed within 48 hours. Apply 1 pipette of 0.45ml topically to the skin at the back of the neck.